A lot of people think that a bill to reform state authorities, passed by the state legislature but awaiting Governor David Paterson's increasingly unlikely signature, is a good idea. The New York Times, in an editorial July 23 headlined New York’s Phantom Government, praised the idea of an independent authorities budget office with subpoena power, and an automatic review by the state Comptroller's office of authority contracts valued at more than $1 million. The Buffalo News praised the legislation. So did Newsday. State Comptroller Thomas DiNapoli said, "Assemblyman Brodsky and Senator Perkins’ bill is the first major step toward public authority reform we’ve seen in years. It’s long overdue." While no one has used the Empire State Development Corporation (ESDC) as an example, I wonder if the ESDC board would be following a fiduciary duty if it voted to approve Atlantic Yards without a current fiscal impact analysis or a (never-conducted) cost-benefit analysis. Could the board have approved AY in 2006 without considering the availability of housing bonds and can it do so going forward? You'd think that Paterson, who needs editorial support for his increasingly shaky bid to win election to the office he assumed upon Gov. Eliot Spitzer's resignation, would sign the bill, which was championed by Assemblyman Richard Brodsky and state Senator Bill Perkins. But apparently he's listening to Mayor Mike Bloomberg and others who think the bill goes too far. The Times reports, in an article to be published Saturday, that the Paterson administration seeks a compromise bill, but that will be difficult because the governor and mayor have many objections to the current bill. The comptroller review, they say, would be too time-consuming, and a provision about contact with lobbyists would appear to include officials in other government agencies. It's unclear from the article whether they mayor and governor object to the budget office, but it is clear that Bloomberg opposes the requirement that board members have a fiduciary responsibility to the authorities and their missions rather than to the official who appointed them. The mayor also believes restrictions that would prevent authorities from selling off their land for below fair market value could hamper a number of developments, including a $700 million East Harlem project, which includes 600 housing units for low- and moderate-income families, and the East River Science Park, a $700 million complex in Manhattan that the city hopes will make it a leader in biotechnology. Ira Millstein, a lawyer who led the commission on authority reform said the arguments were "bogus” and it was a question of power. Brodsky said in a statement today, "Real reform is never easy. Governor Paterson can protect the status quo, the mushrooming debt, the questionable and sometimes corrupt actions we repeatedly uncovered, or he can stand up for real change. The Legislature crafted the bill with almost no activity or interest by the Paterson Administration. The opportunity to raise questions was available and no interest was shown. And the arguments made by the Mayor and some in the Administration are simply bogus and untrue. We've seen the national health care debate poisoned by false allegations. We won't let the decision about true authority reform to fall victim to that tactic." 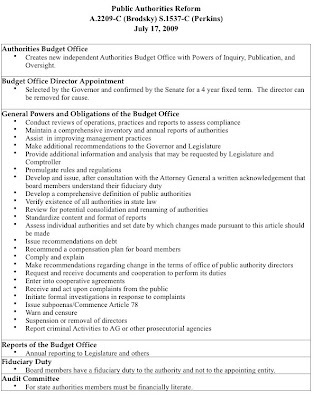 Building on the work done with the 2006 Public Authorities Accountability Act, this legislation creates a new independent Authorities Budget Office (ABO) with powers of inquiry, publication, and oversight. The ABO will conduct reviews of operations, practices and reports to assess compliance of all public authorities and their subsidiaries. They will issue recommendations to the Legislature, Governor, and Attorney General on all aspects of Public Authorities, including debt and compensation of board members. Furthermore, the ABO will develop and issue, after consultation with the Attorney General a written acknowledgement that board members understand their fiduciary duty. Members of authority boards will no longer be beholden to those who appoint them. They will have an explicit fiduciary duty to the authority and their mission. Board members’ primary responsibility will be to ensure that the authority runs in the best manner possible. lic authorities. Also, public authorities must submit debt reform measures to the ABO. The legislation will also limit the amount of debt Subsidiaries of Public Authorities may issue. This legislation will require each authority to submit to the comptroller contracts over $1 million. 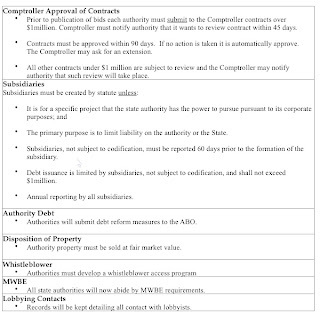 Having this oversight of contracts will prevent fraud and mismanagement while keeping the authority focused on its mission. Public Authorities will no longer be able to create subsidiaries whenever they feel the need to. Unless formed for a very specific purpose, subsidiaries will now only be formed with the approval of the legislature. Authorities will no longer be able to use subsidiaries to create more debt without a clear purpose and proper oversight. All authority property must now be sold at fair market value. It's clear that democracy has no place in Mayor Bloomingdale's universe. As for poor Gov. Patterson, who appears to have both limited vision and a mental impairment, it would be fascinating to know who is moving his lips. And where does our big brave attorney general stand on this legislation?